I love to pamper myself and face masks are one of my favourite ways to relax and look after my skin. I have tried a few of Ooharr’s face masks* before and I really enjoyed the results, you can read my review here. When they got in contact with me to review two of their new masks I was really excited to see what these ones had to offer. Ooharr have added a nourishing mask- Juicy Burst* and a rejuvenating mask- Fruity Magic* to their current range. At £1.20 a sachet you really can’t go wrong as each packet gives 2-3 uses, which is so good for the price point. Juicy Burst: This mask claims to leave the skin feeling soft, supple and glowy. This mask contains sunflower oil which is high in Vitamin E to lock in moisture. It also contains a natural antioxidant to help sooth the skin. You can find a full list of ingredients and benefits here. I really like this mask when my skin is feeling dull and lifeless. This mask adds moisture back into the skin, I find this great for dehydrated skin or after a late night or hangovers. This mask is also great left in the fridge for an added cooling effect on the skin. 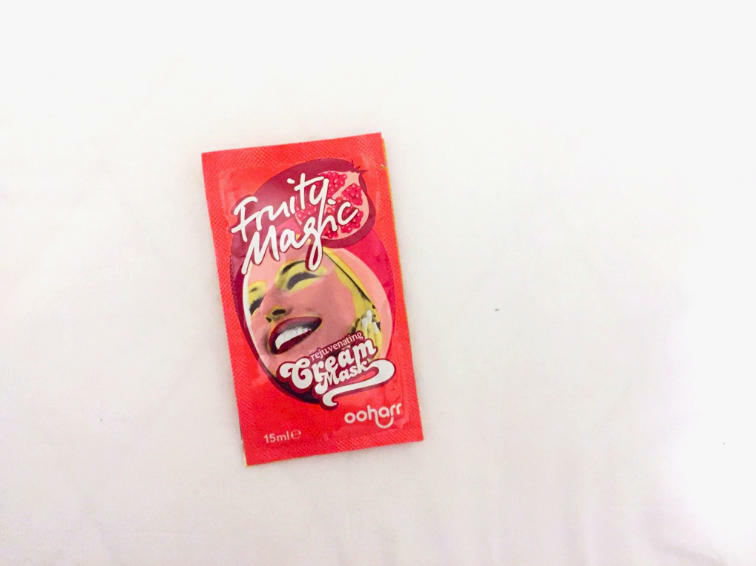 Fruity Magic: This mask claims to refresh and sooth the skin. This mask contains Mandelic Acid which is used to target problem skin such as blemishes and acne. Panthenol which is used in cosmetics for its hydrating and moisturising properties and its ability to penetrate deep into the skin. This mask is ideal for skins that need a bit more tlc in problematic areas and to help deep clean the skin. I like using this mask in hormonal break out areas or in the areas I need it the most. Both of the masks left my skin feels radiant, cleansed and soft. Have you tried any products from the Ooharr range?